Dry scalp is a problematic, annoying condition for many people. Dry scalp is usually a symptom of dandruff, although some other conditions, such as scalp psoriasis, can cause similar symptoms. You can often treat dry scalp at home using medicated shampoos and moisturizing treatments such as leave-in conditioners. Dry scalp causes itchy, flaky patches of skin on your scalp, which can fall out of your hair and onto your clothing when you scratch. You may notice a white powdery substance in your hair or on your clothing. According to MedicalNewsToday.com, dandruff can be caused by both dry and oily skin. If you have a dry scalp, the dandruff flakes will tend to to be smaller and less oily. Dandruff often occurs after puberty and is most common in men and women in their early 20s and continues into middle age, according to NHS.uk. Dietary factors such as deficiencies of vitamin B or a lack of essential fatty acids, alcohol, stress or environmental changes may also play a role in the development of dandruff and dry, flaky scalp. Traditional remedies for dry scalp generally focus on the use of medicated over-the-counter or prescription strength shampoos containing ingredients such as tar, zinc pyrithione, salicylic acid and other anti-fungal or anti-bacterial components, according to MedicalNewsToday.com. Adding moisture back to your dry scalp can help to alleviate some of the symptoms, according to authors Leah Palmer and Nicci Moorman in their textbook for hairdressers, "S/NVQ Level 2 Hairdressing." Palmer and Moorman suggest that moisturizing conditioners such as henna wax or olive oil are beneficial treatments for dry scalp. You can purchase leave-in conditioners containing these ingredients in most drugstores and hair care stores. Homemade leave-in conditioners can also alleviate dry scalp and help to hydrate dry, flaking skin. 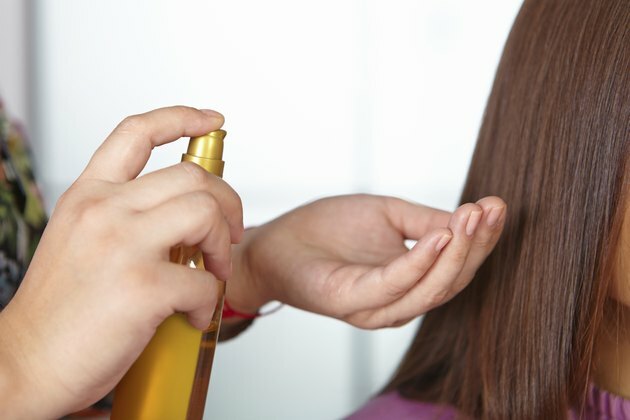 In her book, "Every Woman's Guide to Beautiful Hair at Any Age: Learn What Can Be Done to Keep a Beautiful Head of Hair for a Lifetime," author, cosmetologist and trichologist Lisa Akbari states that you can use a light oil as a leave-in conditioner to help alleviate dry scalp symptoms. Apply a small amount of a light oil, such as almond or olive oil, to your scalp and gently massage into damp hair and scalp after washing. If your dry scalp persists despite the use of home remedies, see a dermatologist. You may have another condition, such as seborrheic dermatitis, that causes symptoms of dry scalp. A dermatologist can accurately diagnose your condition and discuss possible treatment options. Medical News Today:What Causes Dandruff? How Can I Treat Dandruff?